The pup, nicknamed Roger, is the first northern fur seal to be born at the Moscow Zoo in two decades. The zoo released footage of Roger, a two-month old seal pup, coddling, playing and swimming with his mother on a balmy autumn day. The pup weighs about 12 kilograms, and depends on his mother's milk for sustenance. 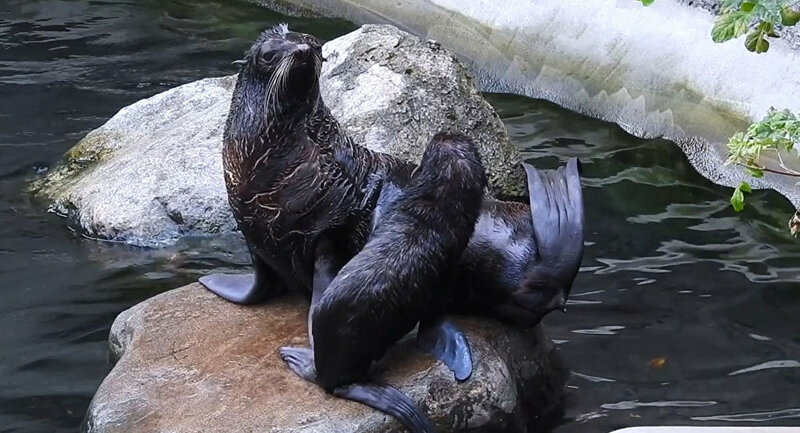 It joins four other seals living at the zoo, including a 12-year-old male named Pirate, two adult females, Yushka and Sparta, and Dori, a young female. All of them were born in the wild. "The birth of a seal pup is a great and joyful event for the Moscow Zoo. The fact that animals have given birth to a healthy offspring indicates that they are comfortable and calm in the conditions created by our Zoo," director Svetlana Akulova said in a statement published by the Moscow Mayor's office. According to Akulova, the zoo's seals are among its "most active residents," and enjoy interacting with visitors, diving, swimming, and jumping out of the water suddenly when people gather to watch them. The northern fur seal, once prevalent in the Russian Far East, off the coast of the Koreas and Japan and the west coasts of Canada and the United States, is listed as 'vulnerable' in the IUCN Red List of Threatened Species. Russia's Komandorski Islands off the coast of Kamchatka have been designated a protected area for the northern fur seal. Zoos and aquariums around the world are continuing their efforts to create a reserve population.